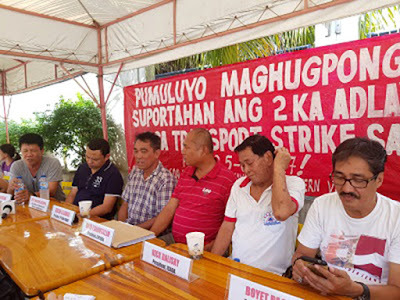 The militant labor group Partido Manggagawa (PM) expressed solidarity with the jeepney drivers who are on strike today and tomorrow in the islands of Panay and Negros in protest at the phase-out scheme of the government. “Workers do not oppose modernization and the shift to environmentally-friendly public transportation but the transition must be just. Social justice must accompany social progress. The lives and livelihood of thousands of jeepney drivers cannot be sacrificed in the name of change,” declared Elmer Blancaflor, spokesperson for PM-Iloilo and also president of the United Panay Truck Drivers Association. The group is supporting a just transition for the jeepney sector in the face of the government’s plan to immediately phase-out PUJ’s that are 15 years and older. PM, the labor center Sentro and its affiliate National Confederation of Transportworkers Union are supporting the strike being launched in Iloilo City and the whole of the Panay island by the groups Iloilo City Loop Alliance of Jeepney Owners and Drivers Associations (ICLAJODA) and Confederation of Iloilo Province Jeepney Operators and Drivers Associations (CIPJODA). 4. Study on the most appropriate alternative to jeepneys such as electric jeeps or hybrid, LPG or Euro4 engines. Blancaflor also slammed the draft Department of Transportation order requiring PhP 7 million as capitalization for jeepney operators. “The capitalization requirement is discriminatory and anti-poor. It will lead to the gentrification of the jeepney sector and the dominance by big capitalists to the detriment of ordinary Filipinos presently derive their livelihood as operators,” he explained. PM said that the two-day strike is a just a preview of larger protests and a nationwide strike later if the jeepney drivers’ demands are not met.